The new consumption model introduced by cloud video licensing (as opposed to the traditional hosting of conferencing infrastructure on-site) has created some interesting purchasing options. It’s worth digging into to see if there is a clear winner in terms of bottom-line cost and value. 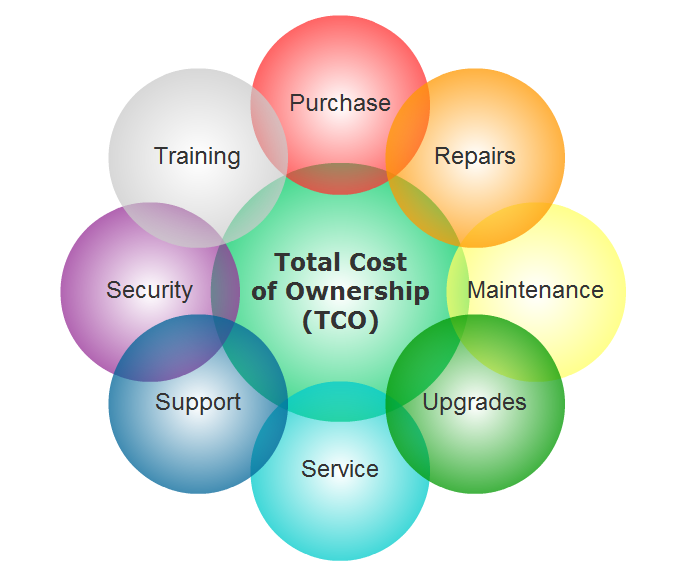 Total cost of ownership (TCO) is a financial estimate intended to help buyers and owners determine the direct and indirect costs of a product or system. It encompasses every aspect of owning, leasing or licensing a product or service. We won’t get into hard figures here, but rather talk about all the considerations that should be taken into account when deciding which way to go: on-prem or in the cloud. This is the difference between the purchasing models, and why it gets tricky comparing apples to apples. SaaS or Cloud licensing changes the type of expenditure from the traditional high initial capital expenditure (CAPEX) up front when purchasing hardware bridges, to an operating expenditure (OPEX) paid at regular intervals. It’s generally accepted that buying (instead of leasing or licensing) makes sense if you’re certain you have the right solution and plan on using it for the foreseeable future. Like 10-20 years down the road. That investment is sound. It may be less expensive in the long run than paying to lease that same type of service for the same amount of time. The downside, of course, is that there’s very little safety net – it’s not like you can return it if you don’t like it or if technology shifts. That money is spent. And taxed. That is one of many considerations. Let’s take a look at some of the other factors below. When looking at conferencing bridge hardware, buyers have to purchase based on what they believe their maximum call volume will be. Misjudge that number? Out of luck. When you run out of ports, no one else will be able to join a call over that bridge. Another consideration in on-prem may be redundancies. Is conferencing system mission- or business-critical? A customer will have to consider purchasing backup systems. In the cloud model, instead of purchasing the bridges themselves, consumers license access to a certain number of ports on a virtual bridge. There is a little more flexibility in considering how many ports they need. They still need to estimate based on expected usage and company size and buy for that. But if they go over the limit they’ve anticipated, a) they automatically have access to additional ports, meaning no one is blocked from joining a call and b) they can simply pay overage charges, and/or purchase additional ports licensing during the next cycle. And ports pricing get better the bigger the company and more potential users there are. There may be further flexibility in cloud pricing based on the length of contract signed. Costs may go down over a multi-year contract, because most margin is made by the service provider after their initial investment in the customer has been paid off. This is the same story whether going with a classic cloud setup or one where the customer is integrating with Skype or similar. On-premise systems require some initial set-up, even if there’s to be no integration with other systems or customization. On top of the physical bridges, this could mean installing software, configuring the database, and testing. You can be guaranteed it will be labour-intensive for your IT staff. While there is nothing to be installed with a true cloud video system (unless it’s being bundled with conferencing hardware, but that’s outside the scope of this discussion), vendors of mid- to high-end systems may charge a set-up fee for the work they do on their end. Upgrades and updates are a necessary part of any on-prem deployment, thanks to ageing infrastructure and rapidly evolving technology. This may not look too different from the initial installation: you need to involve outside technicians, or at very least chew up time within your own IT department. It may or may not involve new hardware, and any costs associated with a rip-and-replace. In the cloud, upgrades are typically incremental in nature. There is no spike or fees out of the ordinary; like most of the service, this cost consideration is built into the subscription cost. This is a standard additional cost on top of the initial CAPEX purchase of the bridges. Sensitive infrastructure must be maintained or it will stop working eventually. If you’re making the investment in the hardware, you’d better be investing in a maintenance program. In the cloud, this is a cost factored into the monthly licensing fee. Customers are paying a portion of the maintenance virtual bridging. When it comes to repairs, it’s rare that on-prem infrastructure needs physical repairs beyond regular maintenance. But if something bad happens (like water damage, or something crazy like a tipped rack), the customer is on the hook to repair or replace. Better hope insurance covers it. This is almost a non-factor in the cloud. A tiny percentage of the cost associated with the service-provider’s insurance may be included in the monthly fee. When a service that you depend upon goes down, it costs you money by disrupting your money-making processes. Service for on-prem stuff can be tricky. You can usually reach someone on the phone to help troubleshoot, but you have to relay statistics and system logs. It can be a drawn-out process. You’re further slowed when you need someone to visit on-site. The cost of NOT operating in this time can be pretty high. In the cloud, your issue it the service-provider’s issue, and they can act quickly. By hosting your service, they have access to all the info they need in real-time. Often times they can even let you know there’s an issue before you’re aware of it yourself. Security on-prem means costly, proprietary security software and chews up all sorts of man hours getting it done. There is substantial cost-savings here. Security, both in terms of encryption and avoiding system viruses and similar, is constantly monitored by the service provider. An incident involving the leak of sensitive info and/or hacked systems endangers the service-provider’s entire business, and as such is of the highest priority. The system is regularly upgraded with the most up-to-date security programs and protocols. Both on prem and cloud solutions require training up front. The benefit to cloud in this case is that the living interface is typically improved upon regularly to become more and more intuitive and user-friendly. Beyond that, solutions like RP1Cloud work to integrate and maintain workflows that customers are already used to. Accustomed to collaborating within your Skype network? Integrate with RP1Cloud to add the ability to reach people outside of your network over video, without changing how you organize or join meetings. Details like these save training time and help reduce the TCO. Winner: in the case of video conferencing, it’s the cloud. Given that most expenses that you’d incur in an on-prem system are factored into the cost of a monthly subscription, on a shorter timeline, you’re safer in an OPEX model. Working on an operating budget is always easier and more predictable, even when equal to or more expensive over an extended timeline.